Having the right hydro excavation equipment is crucial to reaching delicate and fragile under-ground structures. Hydro excavators use water to do the digging for you; hydro vac excavation avoids the possibility of cutting through electrical lines or pipes. Our hydro excavation water trucks come equipped with water heaters and produces high pressure low volume streams to quickly and safely dig. When you incorporate high pressure, low volume streams achieve maximum efficiency by clearing dirt and debris while using the least amount of water. Hydro excavation equipment is safe for operators and friendly for the environment, unlike traditional excavation tools that have been used in the past. Hydro Excavators are great for removing all of the necessary dirt and debris without excessive damage to the surroundings. The Vactor HXX Hydro Excavator is a powerful machine that can tackle major excavations while still providing safe, non-destruction digging in a wide range of applications. 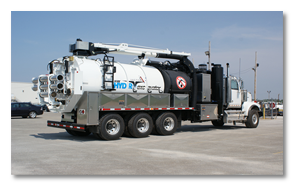 The HXX Hydro excavator comes from Vactor Manufacturing who for over 50 years has been supplying contractors and municipalities with durable, reliable products using air conveyance, high pressure water and vacuum technology. 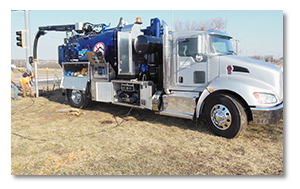 The Vactor Hydro excavator was designed and engineered as a purpose built hydro excavator with contractor input throughout the process. Tough and reliable, built to work in freezing conditions as well as in the extreme heat of summer. The Vactor HXX can increase worksite safety and decrease the cost of digging by avoiding the tremendous expense associated with power outages, burst waterlines or gas explosions that can result when a backhoe, trencher or other mechanical earth mover hits a buried utility. It also allows the operator to perform precision excavating, a less-invasive method that causes less surface damage than traditional digging methods. Based on the experience of its predecessor, the Vactor Hydro-excavator and several years of vacuum excavation research and testing – the new Vactor HXX Prodigy vacuum excavator is the perfect non-destructive machine for utility and municipal applications. Versatile enough to excavate using either air or water as a digging medium, the Prodigy features a 16-inch Hg, 3200 CFM PD blower with a custom-designed and optimized filtration system that can handle both digging mediums, air (185 cfm/150 psi) and water (10 gpm/ 2500 psi), without a bag house. Featuring a compact, lightweight design, the Prodigy can carry up to 600 gallons of water and 6 cubic yards of debris and can perform in the toughest climatic and soil conditions, for more uptime and lower operating costs. And with the HXX Prodigy available with 6 inch hose and optional telescopic or extendable boom there is no more struggling with the less productive, harder to handle small 3-4 inch vacuum lines found on most trailer units. Prodigy is also available in a larger capacity 9 yard, tandem axle configuration.